Al Fresco Entertaining – means out in the open, is a great way to enjoy the later part of summer. Besides firing up the grill, if you organize a few other things, everyone will have a blast. Inviting company over to your backyard is simple and you should keep things simple. However, simple does not mean boring or uncomfortable. 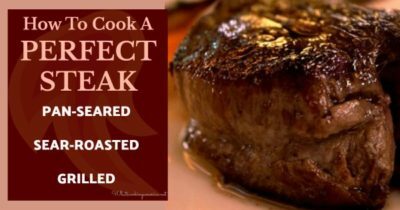 If you need a yummy menu, check out our easy summer dinner menu that starts. Nothing says party or good times like a few decorations. Easiest is to dig in the attic and find your strands of holiday lights. String them over the patio or deck or even run them around the fence or in your trees. A colorful garland of fabric is a simple decoration. 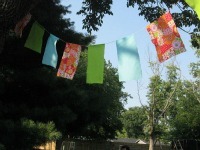 Cut out flag triangles from your extra stash of fabric and hot glue it to a string to flutter in the breeze. Fold tissue into flowers, tying in the center, and hang from the trees to blow in the wind. Gather up clear jars and drop in votive candles. Line the deck or sidewalk with these. Al fresco entertaining requires music, it sets the tone. Come up with a playlist just right for your group of friends and the occasion. Bring out some speakers and get the party going. Be sure to have seating. If you don’t have tons of patio chairs, you might even ask guests to bring their beach chair to the event. Either way, make sure people do not need to stand up all night. Tackle the bug issue. Fog the yard early in the day or light some citronella candles. Be sure to have some bug spray or even bug bracelets for tender-skin guests who are being bitten. If the evening or afternoon is hot and still, bring out some fans to plug in. It’s hot in the summer and a cold drink goes a long way. Self-serve is the way to go for a backyard event. Washtubs of iced down beverages are always festive. A special beverage, like this strawberry-lemonade, is sure to be a hit. Buy some colorful striped straws! Flowers and summer just go together. If you are not a big gardener, pick some up at the grocery store. Use something casual to hold your flowers like this wooden box. Other good choices are beverage bottles, Mason jars, canisters, sand pails from the beach and so on. Make sure to think not just about the menu but where and how you will serve it. Remember to keep the cold food cold. You might want to nestle salads in coolers of ice. Have screen dish covers handy in case of flies or set up the buffet line inside. Be sure to get sturdy plates if people are going to be carrying them around. Check out our picnic safety tips. You do not have to turn into the cruise director and order folks around. Just put some great outdoor activities front and center. You will soon see that someone has picked them up and is having a go at horseshoes, bocce ball, or croquet.